Although it is a sunny day in September, I’m having a våffeldagen here at home. National Waffle Day (Våffeldagen) is a Swedish tradition every March, with the word coming from Vårfrudagen, Our Lady’s Day of Ascension. This entirely non-religious holiday simply requires at least one meal consisting of lovely, fluffy Swedish waffles, usually with freshly picked strawberries and cream or yogurt. These crisp and light waffles make an easy, darling breakfast-in-bed treat and keep well in the fridge or freezer. 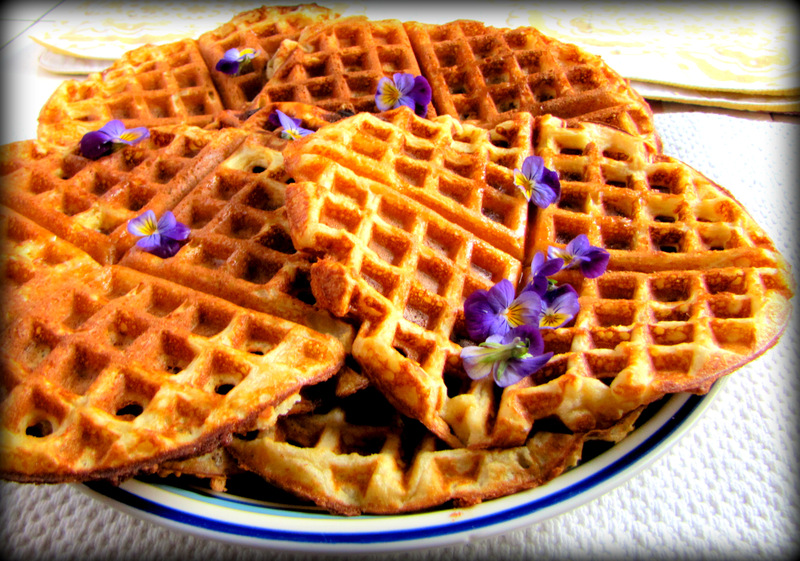 *For a savory waffle, omit the sugar, vanilla and cinnamon. Instead, double the salt and add 1/4 tsp. black pepper. I also like to add cumin seeds, fresh chives and oregano, especially with Waffles Rancheros (variation details below). I n a large bowl, combine flour, baking powder, salt and sugar. In a small bowl, lightly beat together the egg yolks, milk, melted butter and vanilla. Stir into dry ingredients just until combined. Be careful to avoid over mixing at this point. In a separate bowl, beat egg whites to stiff peaks; gently fold one half into the batter at a time. Bake in a lightly buttered preheated waffle iron until golden brown. Keep warm in a 200F oven if necessary. Serve with fresh fruit (strawberries or blueberries are lovely! ), whipped cream, yogurt or maple syrup. Add 1/3 c. canned pumpkin, 1/4 tsp. nutmeg, 1/4 tsp. allspice, 1/4 tsp. cinnamon. Top with whipped cream and a grating of fresh ginger. Make the savory waffle substitutions and use 1/2 c. blue corn flour in place of 1/2 c. flour. Cook according to recipe above. Top one cooked waffle with a big spoonful of black beans, one fried egg, chile (either New Mexican red or green, or salsa), cilantro and cheddar cheese.